It will surprise exactly no one that Ted Cruz is not a fan of immigration, but I suspect that few appreciate how nonsensical this is given his family history. Rafael Edward Cruz, who mocks Beto O’Rourke for using his lifelong nickname even though he goes by Ted, was born in Canada in 1970 and retained his Canadian citizenship until May 14, 2014. His father, Rafael Bienvenido Cruz Diaz, was born in 1939 in Cuba, and came to the U.S. in 1957 on a student visa to study at the University of Texas. In a 2013 NPR interview, the senior Cruz said that once his student visa expired, he was granted political asylum in the U.S. and obtained a green card. But several years later, he re-emigrated to Canada where he lived for approximately eight years and did something he hadn’t done in America — become a citizen. But the immigration pattern doesn’t stop there. In a book he wrote entitled A Time for Truth, Ted Cruz stated that his grandfather, Rafael Cruz Gonzalez, was born in the Canary Islands. 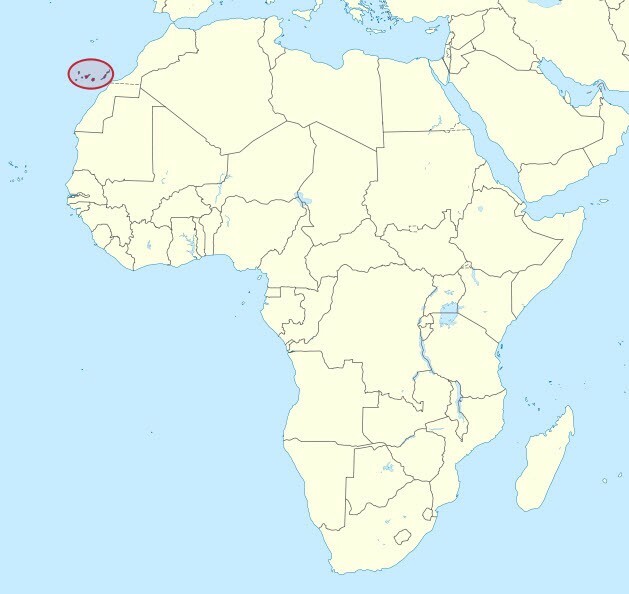 Situated off the Northwest coast of Africa, this archipelago is an autonomous community of Spain. 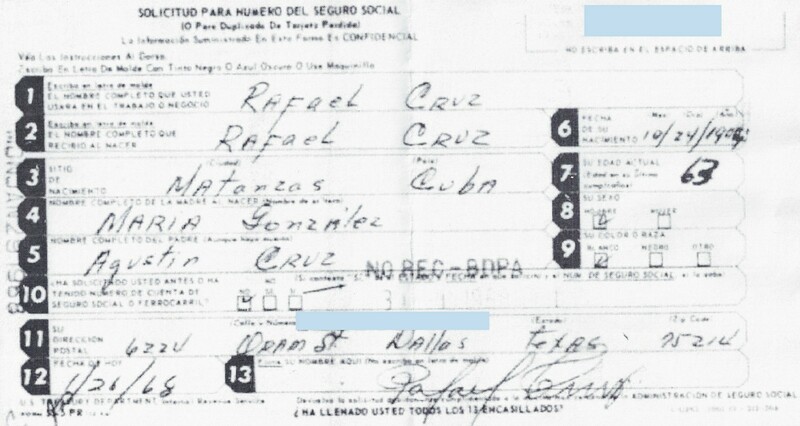 Cruz explained that his grandfather’s parents took him from the Canary Islands to Cuba as a baby in 1902, the same year Cuba became an independent republic. In his Social Security application, however, his grandfather himself claimed to have been born in Cuba. But he also gave his year of birth as 1904 while other sources say 1900 or 1901, so it’s hard to assess accuracy and determine who’s telling the truth. Regardless of whether he was born in the Canary Islands or Cuba, he left Cuba at the age of sixty-something and immigrated to America in the 1960s, residing in Texas until he died in 1991. But wait — there’s more! Ted Cruz’s great-grandfather, Agustin Cruz — the one who may or may not have taken his infant son across the Atlantic with him — was born in the Canary Islands and emigrated to Cuba, so he too was an immigrant. I’ve shared the concept of what I call “country shopping”– the notion of bouncing around several countries seeking the greatest personal advantage — in previous articles, and Cruz’s family exemplifies this. In his case, the overall chain is Spain (Canary Islands) → Cuba → United States → Canada → United States, though at least one of his forefathers managed to squeeze in three countries in a lifetime. And it’s worth noting that this is only one branch of his family tree. 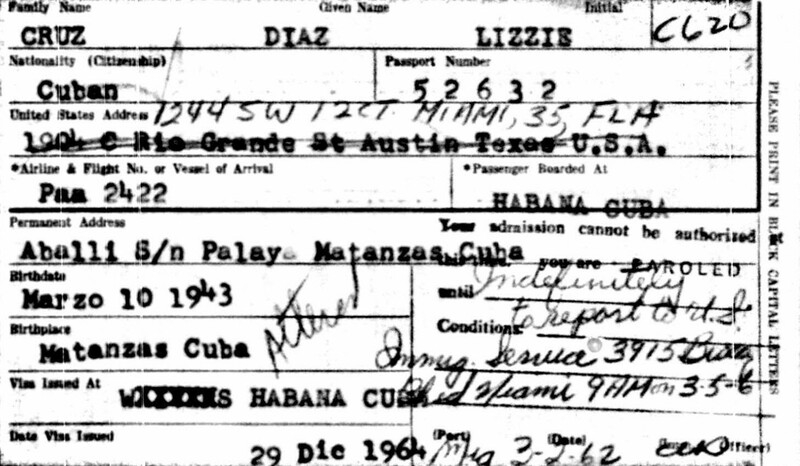 I’ve already mentioned that Ted Cruz’s father was granted political asylum which apparently stemmed from Fidel Castro’s assumption of power in Cuba in 1959. Though a youthful supporter of Castro, Rafael Cruz soon soured on him, and not so incidentally, had a young family in America. But he was not the only member of the family so affected. His sister Lizzie, for all intents and purposes, was part of Operation Peter Pan in which parents, desperate to get their children out of Cuba, sent them to America by themselves. Arranging the necessary paperwork was easier for children than for adults, so an estimated 14,000 children made the journey solo with the hope of one day reuniting the family either in Cuba or the United States depending on how permanent Castro’s takeover proved to be. Perhaps one of the best known immigrants from this initiative is Miguel Bezos, Jeff Bezos’s future stepfather. I qualify Lizzie’s involvement because the initiative focused on children aged 12 to 18, and while she was 18 at the time of departure, she would turn 19 just eight days later, so was a borderline case. Still, given that roughly 40% of those on her flight from Havana to Miami were unaccompanied minors, it’s clear that this was part of Operation Pedro Pan, and regardless of the specifics, she — like her brother and so many arriving at our border today — was an asylum-seeker. A few years later, Rafael and Lizzie’s parents would also leave Cuba for America. So Rafael took the lead in 1957, Lizzie followed in 1962, and the parents in 1966 — which sounds a lot like chain migration. Curiously, soon after his family was reunited in the States, Rafael left for Canada. 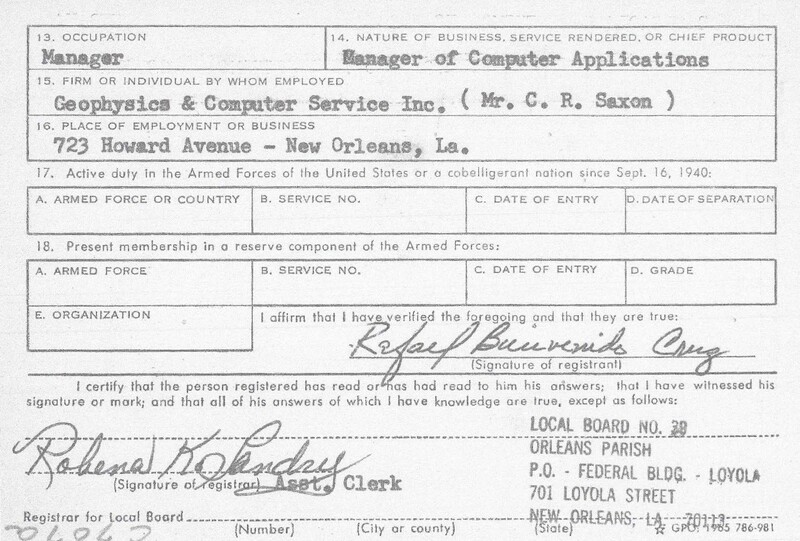 His first marriage had come to an end and he moved from Texas to New Orleans where he was living as of July 1967 as seen in his draft registration card below. This is when he decided to strike out again and how Ted would wind up being born in Calgary. Consider this: No male Cruz in Ted Cruz’s direct line has died in the country of his birth for generations, starting at least as far back as his great-grandfather — meaning since 1870–1880 or so. On the reasonable assumption that he eventually dies in any country other than Canada and his father in any country other than Cuba, his family will be approaching two centuries of starting life in one country and ending it in another — sometimes with a third tucked in between. 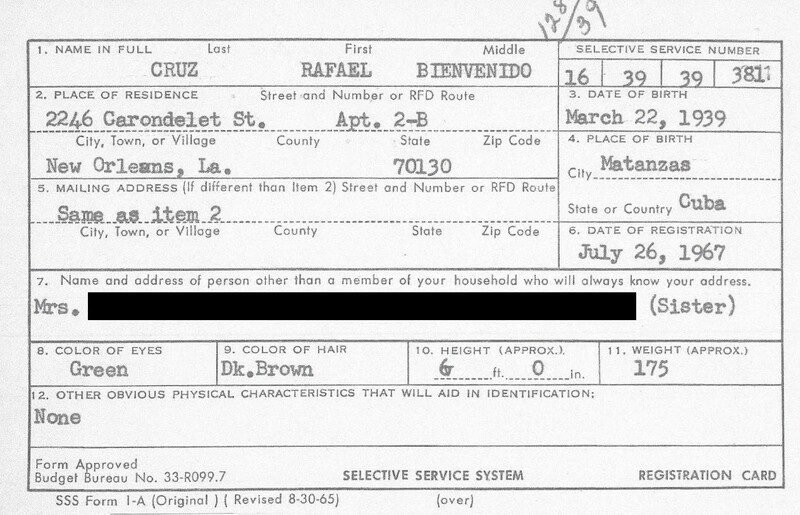 It’s not an exaggeration to say that immigration is the defining characteristic of the Cruz family. It’s what they do. Luckily for them, they have repeatedly been welcomed on their country-hopping wanderings — whether they were refugees or not. Bearing that in mind, wouldn’t you think that Ted Cruz’s family would be one of the most welcoming of all?